A Z-score or standard score is a numerical measurement of a value’s relationship to the arithemic mean of the data set. The Z-score is the signed number of standard deviations by which the value of a data point is above the mean or below the mean value of the data set. For a normally distributed sample, 95.8% of the Z-scores of all data points fall within the range [-2, +2]. A Z-score of 0 indicates that the data point is identical with the arithmetic mean of the data set. The Z-score is a normalized oscillator that can be used to identify extreme readings of the input series. The Z-score is calculated by dividing the absolute difference between a data point and the arithmetic mean by the standard deviation. 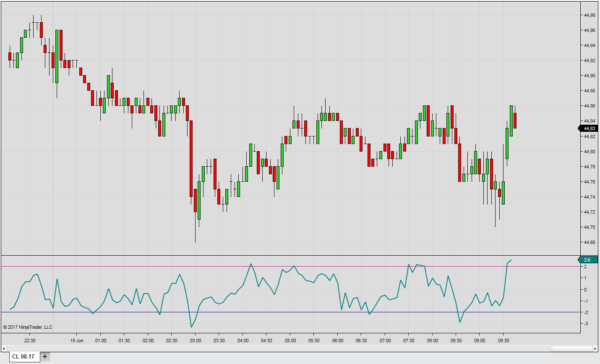 One of the main applications of this indicator is that it can be used to normalize any oscillator. For example, the MACD is a non normalized oscillator which does not pass the c-test intorudced by William Eckhardt. However, when the Z-score is used to normalize the MACD, the resulting oscillator uses a normalized scale and will pass the c-test. The normalized MACD is obtained, when the MACD is used as the input series for the standard score.